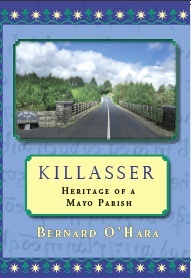 The paperback version of Bernard O’Hara’s superb Irish parish history, “Killasser: Heritage of a Mayo Parish” has been uploaded to the printers. After checking the final proofs, the paperback will be on sale in the USA and UK in early August. Update: “Killasser: Heritage of a Mayo Parish” paperback version. The paperback version of Bernard O’Hara’s superb Irish parish history, “Killasser: Heritage of a Mayo Parish” is currently progressing well. The anticipated publication date for USA release is early June.